The story of the double helix's discovery has a few new twists. Two professors at the Watson School of Biological Sciences at Cold Spring Harbor Laboratory (CSHL) have uncovered a new primary source – a never-before-read stack of letters to and from Francis Crick, and other historical materials dating from the years 1950-76. The letters both confirm and extend current knowledge of the circumstances surrounding the epoch-making discovery of DNA's elegant double-helical structure, for which Crick, James D. Watson (now CSHL's chancellor emeritus) and Maurice Wilkins were awarded the 1962 Nobel Prize in Medicine and Physiology. Unlike the structure itself, which amazed even its discoverers in its simplicity, the story of the discovery has revealed a complex tangle of people, ambitions and institutional politics behind the process of scientific investigation. "It's primarily the insights these new letters provide about the personalities of the discoverers that people will find most fascinating," says Alex Gann, Ph.D., who along with Jan Witkowski, Ph.D., uncovered the new Crick materials and co-authored a paper on them that appears in the journal Nature Sept. 30. Following the publication of landmark works including Watson's confessional ‘The Double Helix’ in 1968 and Horace Freeland Judson's ‘The Eighth Day of Creation’ 11 years later, most historians have been content to believe that the archives had been fully explored and would not reveal much more about the double helix story. But 34 of the newfound letters are between Crick and Wilkins and draw attention to what Gann and Witkowski have described as Wilkins' "tortured soul" during the critical period 1951-53, when Watson and Crick were alternately put on, taken off and then restored to an effort to discover DNA's structure. "We are really between forces which may grind all of us into little pieces," Wilkins wrote to Crick in one letter. As Witkowski explains, "Maurice Wilkins on the one hand wanted to be open – he believed science should be open and was all in favour of cooperation, the exchange of ideas and data; but on the other hand, he was also mindful of his own career: he knew he had to get results and publish papers." As the upstarts Watson and Crick, then unknowns, jockeyed for permission at Cambridge to explore the DNA structure problem, Wilkins, at King's College, was already well engaged in experimentation that would prove vital in determination of the solution. Wilkins' boss at King's, John Randall, hired Rosalind Franklin and had, unknown to Wilkins, assured her that she was in "sole charge" of the DNA work at King's. This led to conflicts between Franklin and Wilkins, who assumed he and Franklin would be partners. This was but the beginning of a series of now historic misunderstandings. Between the lines of the newly discovered Crick letters with Wilkins, one grasps, on Wilkins' end, the anguish, and on Crick's, what at times comes across as the self-assurance and jocularity of the player possessing superior position. This is but a fraction of the newly found letters, which were uncovered unexpectedly in the midst of an archival collection of materials donated to Cold Spring Harbor by Sydney Brenner, the distinguished molecular biologist and Nobel laureate, who worked alongside Crick following discovery of the double helix. The two shared an office at Cambridge from 1956 to 1977. Coincidentally, the CSHL Press has just released a new biography of Brenner by Errol Friedberg. Among the new letters, there are some 30 between Crick and George Gamow, dating to 1953-64. Other of his correspondents included Leo Szilard, C. P. Snow, and J. Robert Oppenheimer, among many others. The most important of the new letters, cited in the Gann-Witkowski paper, are now in the process of being digitized at the CSHL Archives to facilitate public access. Mila Pollock, Executive Director of the CSHL Library and Archives, says it is her hope that digitization will proceed so that the Crick correspondence in its entirety will be accessible to all via the Internet. The greater part of the collection resides at the Wellcome Library. Stem cells that glow like fireflies could someday help doctors heal damaged hearts without cutting into patients' chests. In his University of Central Florida lab, Steven Ebert, an associate professor in UCF's College of Medicine, engineered stem cells with the same enzyme that makes fireflies glow. The "firefly" stem cells glow brighter and brighter as they develop into healthy heart muscle, allowing doctors to track whether and where the stem cells are working. Researchers are keenly interested in stem cells because they typically morph into the organs where they are transplanted. But why and how fast they do it is still a mystery. Now Ebert's cells give researchers the ability to see the cells in action with the use of a special camera lens that picks up the glow under a microscope. "The question that we answered was, 'How do you follow these cells in the lab and find out where they're going?'" said Ebert. If doctors can figure out exactly how the cells repair and regenerate cardiac tissue, stem cell therapies could offer hope to more than 17.6 million Americans who suffer from coronary disease. The glow of the enzyme also means therapies would no longer require cutting into patients' chest cavities to monitor the healing. Now that scientists can track the stem cells, Ebert said he hopes to use them in disease models to determine how they heal a damaged heart and what conditions are most suitable for the stems cells to thrive. On average, one hundred billion cells in the human body divide over the course of a day. Most of the time the body gets it right but sometimes, problems in cell replication can lead to abnormalities in chromosomes resulting in many types of disorders, from cancer to Down syndrome. 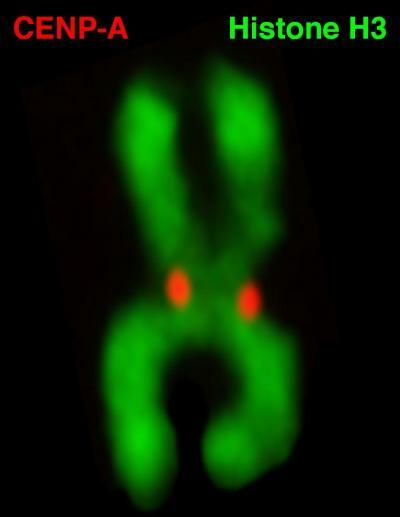 histone H3 variant, CENP-A (red). ﻿ Now, researchers at the University of Pennsylvania's School of Medicine have defined the structure of a key molecule that plays a central role in how DNA is duplicated and then moved correctly and equally into two daughter cells to produce two exact copies of the mother cell. Without this molecule, entire chromosomes could be lost during cell division. Ben Black, PhD, assistant professor of Biochemistry and Biophysics, and Nikolina Sekulic, PhD, a postdoctoral fellow in the Black lab, report in the September 16 issue of Nature the structure of the CENP-A molecule, which defines a part of the chromosome called the centromere. Specialized molecules called spindle fibres attach that help pull daughter cells apart during cell division to this constricted area. "Our work gives us the first high-resolution view of the molecules that control genetic inheritance at cell division," says Black. "This is a big step forward in a puzzle that biologists have been chipping away at for over 150 years." Investigators have known for the last 15 years that epigenetic processes, the series of actions that affect the protein spools around which DNA is tightly bound, rather than encoded in the DNA sequence itself, control part of cell division. Those spools are built of histone proteins, and chemical changes to these spool proteins can either loosen or tighten their interaction with DNA. Epigenetics alter the readout of the genetic code, in some cases ramping a gene's expression up or down. In the case of the centromere, it marks the site where spindle fibres attach independently of the underlying DNA sequence. 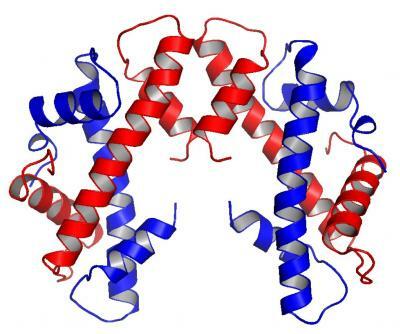 CENP-A has been suspected to be the key epigenetic marker protein. However, what hasn't been known is how CENP-A epigenetically marks the centromere to direct inheritance. The Black team found the structural features that confer CENP-A the ability to mark centromere location on each chromosome. This is important because without CENP-A or the centromere mark it creates, the entire chromosome — and all of the genes it houses — are lost at cell division. ﻿ In this study, Black solved CENP-A's structure to determine how it specifically marks the centromere on each chromosome and surmise from that how the epigenetic mark is copied correctly in each cell division. They found that CENP-A changes the shape of the nucleosome of which it's a part, also making it more rigid than other nucleosomes without CENP-A. The nucleosome is the combination of DNA wound around a histone protein core – the DNA thread wrapped around the histone spool. The CENP-A nucleosome is copied several times to create a unique epigenetic area, different from the rest of the chromosome. CENP-A replaces histone H3 in the nucleosomes located at the centromere. Besides the major advance in the understanding of the molecules driving human inheritance, this work also brings about the exciting prospect that the key epigenetic components are now in hand to engineer clinically useful artificial chromosomes that will be inherited alongside our own natural chromosomes — and with the same high fidelity, says Black. As US government support for personalized medicine grows, a consumer advocate, a patient, and bioethicists explore ethical controversies. Direct-to-consumer genetic tests, privacy, targeted cancer therapies, and Henrietta Lacks are among topics in a special issue of the Hastings center Report. Behind the high expectations raised by personalized medicine – the use of genetic information to individualize treatment, improve care, and possibly save money – a series of essays in The Hastings Center Report examines the challenges in determining what is effective; benefits and drawbacks for patients; and consumers' right to their genetic information, however imperfect. Ronni Sandroff, an editorial director of Consumer Reports, writes on controversies surrounding direct-to-consumer tests and discusses her essay in a podcast. "The Prospects for Personalized Medicine"
A roundup of recent government initiatives to promote personalized medicine, successes with genetically customized drug treatments, and quality control problems with genetic tests is given by Shara Yurkiewicz, a first-year student at Harvard Medical School. How should we determine who should get expensive treatments? If there were a thick, bright line separating the minimal responders from the maximal responders, then we could allocate these treatments fairly. But the reality, explains Leonard Fleck, a bioethicist at Michigan State University, is more like a ragged edge – some people will clearly benefit a lot, some people will clearly not benefit at all, and many people will benefit somewhat. "Personalized Cancer Care in an Age of Anxiety"
To get an idea of how personalized medicine could reshape patient care in the years ahead, one need only look at how it is beginning to reshape the care of patients with cancer, writes Susan Gilbert, Hastings Center staff writer, who surveys those changes. Marian Fontana, a New York author, describes her experience with genetic testing to guide her treatment for breast cancer. "Direct-to-Consumer Genetic Tests and the Right to Know"
Ronni Sandroff, editorial director, Family and Health, of Consumer Reports, appraises the young DTC genetic testing industry in the wake of recent government investigations that exposed inaccuracies and other problems. She argues against having doctors as gatekeepers of genetic information and favours government regulation to insure that the DTC tests are reliable and are not used as marketing devices for unproven products. For personalized medicine to realize its potential, researchers will need thousands of samples of human tissue, blood, urine, and other bio-specimens for genetic studies, writes Karen Maschke, a Hastings Center research scholar. But this need has raised many ethical issues around informed consent and privacy, rendered vividly by recent events, including lawsuits involving use of newborn screening blood samples for research, a legal settlement with the Havasupai Indian tribe over genetic research with their blood, and publication of the bestselling book on the "immortal cells" of Henrietta Lacks. By constructing a microscope apparatus that achieves resolution never before possible in living cells, researchers at Albert Einstein College of Medicine of Yeshiva University have illuminated the molecular interactions that occur during one of the most important "trips" in all of biology: the journey of individual messenger Ribonucleic acid (RNA) molecules from the nucleus into the cytoplasm (the area between the nucleus and cell membrane) so that proteins can be made. The results, published in the September 15 online edition of Nature, mark a major advance in the use of microscopes for scientific investigation (microscopy). The findings could lead to treatments for disorders such as myotonic dystrophy in which messenger RNA gets stuck inside the nucleus of cells. Robert Singer, Ph.D., professor and co-chair of anatomy and structural biology, professor of cell biology and neuroscience and co-director of the Gruss-Lipper Biophotonics Center at Einstein, is the study's senior author. His co-author, David Grünwald, is at the Kavli Institute of Nanoscience at Delft University of Technology, The Netherlands. Prior to their work, the limit of microscopy resolution was 200 nanometres (billionths of a meter), meaning that molecules closer than that could not be distinguished as separate entities in living cells. In this paper, the researchers improved that resolution limit by 10 fold, successfully differentiating molecules only 20 nanometres apart. 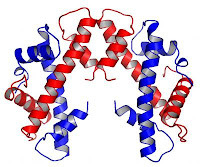 Protein synthesis is arguably the most important of all cellular processes. The instructions for making proteins are encoded in the Deoxyribonucleic acid (DNA) of genes, which reside on chromosomes in the nucleus of a cell. In protein synthesis, DNA instructions of a gene are transcribed, or copied, onto messenger RNA; these molecules of messenger RNA must then travel out of the nucleus and into the cytoplasm, where amino acids are linked together to form the specified proteins. Molecules shuttling between the nucleus and cytoplasm are known to pass through protein complexes called nuclear pores. After tagging messenger RNA molecules with a yellow fluorescent protein (which appears green in the accompanying image) and tagging the nuclear pore with a red fluorescent protein, the researchers used high-speed cameras to film messenger RNA molecules as they travelled across the pores. The Nature paper reveals the dynamic and surprising mechanism by which nuclear pores "translocates" messenger RNA molecules from the nucleus into the cytoplasm: this is the first time their pore transport has been seen in living cells in real time. "Up until now, we'd really had no idea how messenger RNA travels through nuclear pores," said Dr. Singer. "Researchers intuitively thought that the squeezing of these molecules through a narrow channel such as the nuclear pore would be the slow part of the translocation process. But to our surprise, we observed that messenger RNA molecules pass rapidly through the nuclear pores, and that the slow events were docking on the nuclear side and then waiting for release into the cytoplasm." 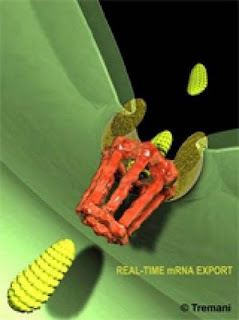 More specifically, Dr. Singer found that single messenger RNA molecules arrive at the nuclear pore and wait for 80 milliseconds (80 thousandths of a second) to enter; they then pass through the pore breathtakingly fast — in just 5 milliseconds; finally, the molecules wait on the other side of the pore for another 80 milliseconds before being released into the cytoplasm. The waiting periods observed in this study, and the observation that 10 percent of messenger RNA molecules sit for seconds at nuclear pores without gaining entry, suggest that messenger RNA could be screened for quality at this point. "Researchers have speculated that messenger RNA molecules that are defective in some way, perhaps because the genes they're derived from are mutated, may be inspected and destroyed before getting into the cytoplasm or a short time later, and the question has been, 'Where might that surveillance be happening? '," said Dr. Singer. "So we're wondering if those messenger RNA molecules that couldn't get through the nuclear pores were subjected to a quality control mechanism that didn't give them a clean bill of health for entry." In previous research, Dr. Singer studied myotonic dystrophy, a severe inherited disorder marked by wasting of the muscles and caused by a mutation involving repeated DNA sequences of three nucleotides. Dr. Singer found that in the cells of people with myotonic dystrophy, messenger RNA gets stuck in the nucleus and can't enter the cytoplasm. "By understanding how messenger RNA exits the nucleus, we may be able to develop treatments for myotonic dystrophy and other disorders in which messenger RNA transport is blocked," he said. Dr. Singer discusses his breakthrough in microscopy, which allowed, for the first time, the tracking of RNA pore transport in living cells in real time. Researchers at Brown University and Women & Infants Hospital of Rhode Island have built an artificial human ovary that can grow oocytes into mature human eggs in the laboratory. That development, reported in the Journal of Assisted Reproduction and Genetics, could help preserve fertility for women facing chemotherapy or other treatments. Researchers at Brown University and Women & Infants Hospital have invented the first artificial human ovary, an advance that provides a potentially powerful new means for conducting fertility research and could also yield infertility treatments for cancer patients. The team has already used the lab-grown organ to mature human eggs. “An ovary is composed of three main cell types, and this is the first time that anyone has created a 3-D tissue structure with triple cell line,” said Sandra Carson, professor of obstetrics and gynaecology at the Warren Alpert Medical School of Brown University and director of the Division of Reproductive Endocrinology and Infertility at Women & Infants Hospital. Carson is a senior author of a recent article in the Journal of Assisted Reproduction and Genetics that describes the innovation. Carson said that the ovary not only provides a living laboratory for investigating fundamental questions about how healthy ovaries work, but also can act as a test bed for seeing how problems, such as exposure to toxins or other chemicals, can disrupt egg maturation and health. What makes the artificial ovary a functional tissue, rather than just a cell culture, is that it brings all three ovarian cell types into a 3-D arrangement similar to a real ovary in the body. The means for making such compositions of cells was invented in the lab of Jeffrey Morgan, associate professor of medical science and engineering, who is a co-author of the paper published online Aug. 25. His so-called 3D Petri dishes are made of a mouldable agarose gel that provides a nurturing template to encourage cells to assemble into specific shapes. To help fund the work, Morgan and Carson applied for and won a Collaborative Research Award from the Rhode Island Science and Technology Advisory Council (STAC). STAC grants encourage research with commercial potential. Morgan has recently founded a local Rhode Island start-up, MicroTissues Inc. The company will begin selling these micro-mould tools in about a month to researchers looking to engineer 3-D tissues. Other funding came from Women & Infants Hospital. The use of stem cells for research and their possible application in the treatment of disease are hotly debated topics. In a special issue of Translational Research published this month an international group of medical experts presents an in-depth and balanced view of the rapidly evolving field of stem cell research and considers the potential of harnessing stem cells for therapy of human diseases including cardiovascular diseases, renal failure, neurologic disorders, gastrointestinal diseases, pulmonary diseases, neoplastic diseases, and type 1 diabetes mellitus. Personalized cell therapies for treating and curing human diseases are the ultimate goal of most stem cell-based research. But apart from the scientific and technical challenges, there are serious ethical concerns, including issues of privacy, consent and withdrawal of consent for the use of unfertilized eggs and embryos. "Publication of this special issue could not have been more timely, given the recent federal district court injunction against federal support for human embryonic stem cell research," said Dr. Jeffrey Laurence, M.D., Professor of Medicine at Weill Cornell Medical College and Editor in Chief of Translational Research. "This court order stops all pending federal grants and contracts, as well as their peer review, suspending over 20 major research programs and over $50 million in federal funding for them," he noted. "This decision has the potential to do serious damage to one of the most promising areas of biomedical research, just at the time when we were really gaining momentum." "The progress that has been achieved in the last 30 years in using allogeneic and autologous hematopoietic stem cells for the effective treatment of hematologic malignancies should serve as a model of how clinical applications may yet be achieved with embryonic stem cells, induced pluripotent stem cells, endothelial progenitor cells, and mesenchymal stem cells. Although several challenges exist in translating stem cell therapy to provide effective new treatments for acute and chronic human diseases, the potential for developing effective new cell-based therapies is high." Rather than focusing on the cancer cell itself, attention to blood vessels feeding the cancerous cells, lined by endothelial cells, presents a new avenue of cancer therapy. The author discusses recent evidence that endothelial progenitor cells may be useful in treating primary and metastatic tumours. Targeted cancer gene therapy using endothelial lineage cells to target tumour sites and produce a therapeutic protein has proven feasible. Early clinical work to develop cell-based therapy for neurologic disorders such as Parkinson's disease is discussed. Both preclinical and early clinical trials have been carried out with allogeneic bone marrow-derived mesenchymal stem cells to treat steroid refractory acute and chronic inflammatory bowel diseases, particularly Crohn's disease. For most people, wisdom teeth are not much more than an annoyance that eventually needs to be removed. However, a new study appearing in the September 17 Journal of Biological Chemistry shows that wisdom teeth contain a valuable reservoir of tissue for the creation of stem cells; thus, everyone might be carrying around his or her own personal stem-cell repository should he or she ever need some. Groundbreaking research back in 2006 revealed that inducing the activity of four genes in adult cells could "reprogram" them back into a stem-cell-like state; biologically, these induced-pluripotent stem cells are virtually identical to embryonic stem cells, opening up a new potential avenue for stem-cell therapy whereby patients could be treated with their own stem cells. However, despite their promise, making iPS cells is not easy; the reprogramming efficiencies are very low and vary among the cells that can be used for iPS generation and thus require good amount of "starter" cells - which might involve difficult extraction from body tissue (unfortunately skin cells, the easiest to acquire, show very low reprogramming efficiency). Now, a team of scientists at Japan's National Institute of Advanced Industrial Science and Technology may have found an ideal source: third molars, commonly known as wisdom teeth. The soft pulp inside of teeth contains a population of cells known as mesenchymal stromal cells that are similar to cells found in bone marrow, a common stem cell source. However, unlike bone marrow, tooth pulp is more easily obtained, especially in wisdom teeth, which most individuals have removed anyway. The different cell lines displayed varying degrees of robustness but in some cases proliferated quite well, up to 100 times more efficiently than typical skin-cell-derived iPS cells. The molar-derived cells also could differentiate into many other cell types including beating cardiomyocytes, as expected. The presence of a supply of MSCs in wisdom teeth could have meaningful therapeutic ramifications. As noted by the researchers and others, wisdom tooth extraction is a common medical procedure in developed nations and, thus, creates a perfect opportunity to remove biological material in a sterilized setting; the teeth subsequently can be frozen and stored for many years until needed. In the meantime, that also provides time for researchers to better understand the details of iPS creation to further increase the efficiency for clinical use. In a paper published as the cover story of the September 9, 2010 Nature, researchers from Harvard University and MIT have demonstrated that graphene, a surprisingly robust planar sheet of carbon just one-atom thick, can act as an artificial membrane separating two liquid reservoirs. due to its extreme thinness. By drilling a tiny pore just a few-nanometres in diameter, called a nanopore, in the graphene membrane, they were able to measure exchange of ions through the pore and demonstrated that a long DNA molecule can be pulled through the graphene nanopore just as a thread is pulled through the eye of a needle. "By measuring the flow of ions passing through a nanopore drilled in graphene we have demonstrated that the thickness of graphene immersed in liquid is less then 1 nm thick, or many times thinner than the very thin membrane which separates a single animal or human cell from its surrounding environment," says lead author Slaven Garaj, a Research Associate in the Department of Physics at Harvard. "This makes graphene the thinnest membrane able to separate two liquid compartments from each other. The thickness of the membrane was determined by its interaction with water molecules and ions." Graphene, the strongest material known, has other advantages. Most importantly, it is electrically conductive. "Although the membrane prevents ions and water from flowing through it, the graphene membrane can attract different ions and other chemicals to its two atomically close surfaces. This affects graphene's electrical conductivity and could be used for chemical sensing," says co-author Jene Golovchenko, Rumford Professor of Physics and Gordon McKay Professor of Applied Physics at Harvard, whose pioneering work started the field of artificial nanopores in solid-state membranes. "I believe the atomic thickness of the graphene makes it a novel electrical device that will offer new insights into the physics of surface processes and lead to a wide range of practical application, including chemical sensing and detection of single molecules." In recent years, graphene has astonished the scientific community with its many unique properties and potential applications, ranging from electronics and solar energy research to medical applications. Jing Kong, also a co-author on the paper, and her colleagues at MIT first developed a method for the large-scale growth of graphene films that was used in the work. The graphene was stretched over a silicon-based frame, and inserted between two separate liquid reservoirs. An electrical voltage applied between the reservoirs pushed the ions towards graphene membrane. When a nanopore was drilled through the membrane, this voltage channelled the flow of ions through the pore and registered as an electrical current signal. 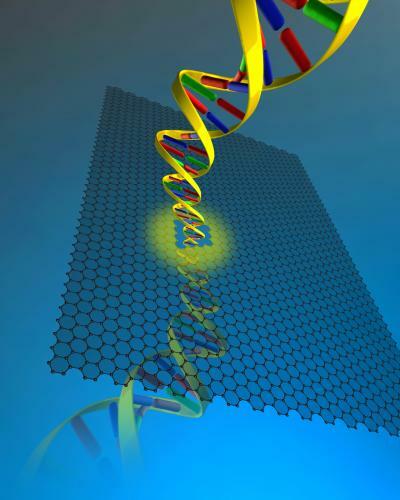 When the researchers added long DNA chains in the liquid, they were electrically pulled one by one through the graphene nanopore. As the DNA molecule threads the nanopore, it blocks the flow of ions, resulting in a characteristic electrical signal that reflects the size and conformation of the DNA molecule. Co-author Daniel Branton, Higgins Professor of Biology, Emeritus at Harvard, is one of the researches who, more than a decade ago, initiated the use of nanopores in artificial membranes to detect and characterize single molecules of DNA. Together with his colleague David Deamer at the University of California, Branton suggested that nanopores might be used to quickly read the genetic code, much as one reads the data from a ticker-tape machine. As a DNA chain passes through the nanopore, the nucleobases, which are the letters of the genetic code, can be identified. But a nanopore in graphene is the first nanopore short enough to distinguish between two closely neighbouring nucleobases. Several challenges still remain to be overcome before a nanopore can do such reading, including controlling the speed with which DNA threads through the nanopore. When achieved, nanopore sequencing could lead to very inexpensive and rapid DNA sequencing and has potential to advance personalized health care. "We were the first to demonstrate DNA translocation through a truly atomically thin membrane. The unique thickness of the graphene might bring the dream of truly inexpensive sequencing closer to reality. The research to come will be very exciting," concludes Branton. The report in the June 4 issue of Cell Stem Cell reveals that an enzyme that changes the way DNA is packaged in cells allows specific genes to be turned on and off, thereby preventing a stem cell from becoming another cell type. Each cell has to fit in 6 feet of highly organized and carefully packaged DNA. Some regions of the DNA are more tightly compacted than others and this structure is dynamic. There are specific enzymes that change how condensed the DNA is to help turn genes on and off. The genes that are turned off generally are found in tightly condensed DNA. To turn genes on, the DNA around those genes is loosened so that activators and other proteins can interact with the DNA. By genetically engineering flies to lack several proteins involved in packaging DNA, in the stem cells of the testes in fruit flies, the research team found that if the enzyme NURF is removed from testis stem cells, the stem cells disappeared. A constant supply of stem cells in the testes is responsible for making cells that eventually become sperm. More staining of the testes with coloured markers showed that these cells hadn't gone away completely, but were becoming another cell type, sperm cells. "This experiment was really hard to do," says Erika Matunis, Ph.D., professor of cell biology from the Johns Hopkins Medical Institutions. "As soon as you remove NURF from these cells, they leave, so you have to take a lot of samples to see how the cells are moving, since we are not looking at living moving cells but rather individual flashes in time." So how does NURF keep stem cells as stem cells? NURF can both turn on and turn off genes. "We still don't know what is happening in this case with how NURF regulates genes to keep stem cells from changing," says Matunis. Matunis' group last year discovered proteins that were able to prevent stem cells from becoming other types of cells in the fruit fly testes. Now they showed that these same proteins also work with NURF to keep stem cells from changing. "By any means this isn't the only pathway though, it's just the one we know more about" says Matunis. "It's probably a tangled hair ball of all kinds of signals going on in these cells that prevent these stem cells from differentiating." NURF keeps stem cells from changing in fruit fly testes, but whether NURF keeps other stem cells from changing still needs to be tested. Matunis believes that proteins similar to NURF will factor into whether a cell decides to change or not in other cell types. The first entire genome of an Irish individual has been sequenced. The sequence is reported in BioMed Central's open access journal, Genome Biology and provides insight into the evolutionary history of this distinct lineage. Led by Professor Brendan Loftus, the research team from UCD Conway Institute used data from a previous genotyping study to select a suitable Irish male representative for sequencing. Then, using pair- and single-ended Illumina short read sequencing, one of the next generation sequencing approaches, the team created 9 DNA sequence libraries, which were overlaid to generate a high quality genome sequence with 11-fold coverage. Analyses were carried out in conjunction with collaborators from Trinity College Dublin, Royal College of Surgeons of Ireland (RCSI), Beaumont hospital, the MRC Human Genetics Unit and University of Edinburgh. The researchers used HapMap and previous gene association studies to identify new DNA variants such as insertions/deletions (indels) and single nucleotide polymorphisms (SNPs). Nearly 200,000 indels and over 3 million SNPs were identified in the Irish genome sequence. Of the SNPs, 13% were novel, potentially including markers specific to Irish ancestry or indicators of disease. In particular, one of the new SNPs interferes with the production of a macrophage-stimulating protein, thought to be associated with inflammatory bowel disease and chronic liver disease. The authors also describe a new way to improve SNP calling accuracy at low genome coverage by using haplotype data from the current Human Genome Diversity Panel and they identify gene duplication events that may show recent positive selection in the human lineage. "The Irish population is of interest to biomedical researchers because of its isolated geography, ancestral impact on further populations and the high prevalence of a number of diseases". The DNA variants in this study, funded through a Science Foundation Ireland Research Professorship award, have been uploaded to the Galaxy computing platform, facilitating the continued full analysis of this interesting genome. The authors hope that this sequence will compliment the ongoing 1000 genomes project, which currently lacks an Irish representative. Human pluripotent stem (hPS) cells can generate any given cell type in the adult human body, which is why they are of interest to stem cell scientists working on finding therapies for spinal cord injuries, Parkinson's disease, burns, heart disease, diabetes, arthritis, and other ailments. Before hPS cell technologies can be translated into clinical applications, however, some obstacles must first be overcome. One such obstacle frustrating stem cell researchers is “cell death” that the major types of hPS cells, including human embryonic stem cells and human induced pluripotent stem cells, mysteriously undergo when cultured as single cells, rendering them less suitable for research. Stem Cell Center at UC Riverside. Researchers at the University of California, Riverside now show that a molecular motor, called “non-muscle myosin II” (NMII), which exists naturally inside each hPS cell and controls various cellular functions, triggers the death of hPS cells when they are broken down to single cells. While many details of how exactly NMII works remain unknown, a wide consensus among researchers is that NMII induces a contraction of the main internal components of the cells, eventually resulting in cell death. 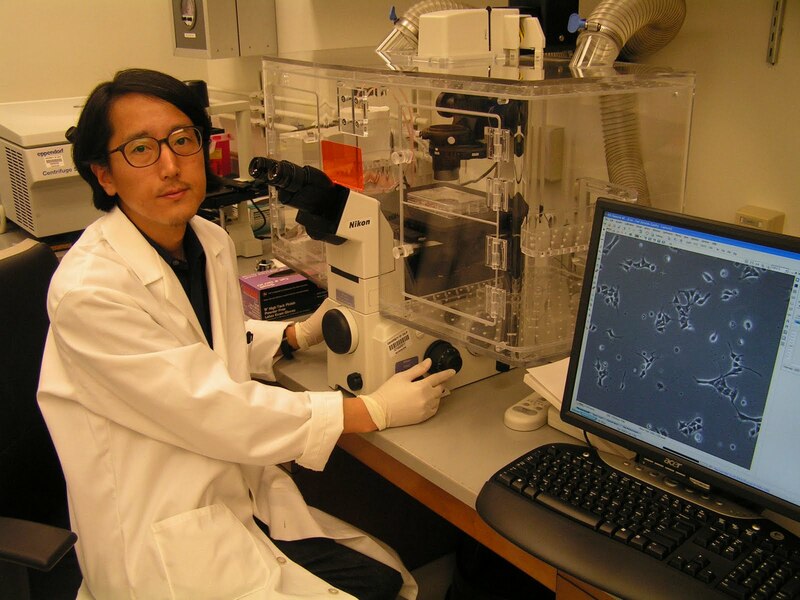 “Our research shows that blebbistatin works as effectively as the most potent cell death inhibitor of hPS cells available today,” said Noboru Sato, an assistant professor of biochemistry, whose lab led the research. Study results appear online, Sept. 7, in Nature Communications. Sato explained that most of the current culture methods to grow hPS cells require animal-derived materials, such as Matrigel, for coating the culture surfaces. Without these materials, hPS cells cannot adhere to the culture plate. But the drawback of using them is that they could potentially cause contamination of hPS cells by introducing viruses and unknown pathogens. “Another advantage of using blebbistatin is that we need no human- or animal-derived materials for coating the culture surfaces,” he said. Available through many companies, poly-D-lysine is a chemically synthesized animal-free coating material that is widely used for cell culture coating for other cell types. For hPS cells to adhere to the poly-D-lysine coating, blebbistatin must be added to the culture medium. “This new method shows that a novel combination of routinely available materials can create a completely distinct technological platform,” Sato said. Vital progress in stem cell research by hundreds of U.S. laboratories is threatened after last week’s injunction prohibiting federal funding for the study of human embryonic stem cells (hESCs). The president of the International Society for Stem Cell Research (ISSCR), Elaine Fuchs, Rockefeller University, U.S., stated that the setbacks for advancing biomedical research on stem cells and translating this knowledge into new and improved treatments for patients are already considerable, and escalate with each day the injunction continues. Sir Ian Wilmut, MRC Centre for Regenerative Medicine, UK, agrees. “To advance the potential of stem cells for regenerative medicine, researchers must be able to study hESCs and uncover their special ability to make every cell of our body, including adult stem cells,” said Dr. Fuchs. The ISSCR is further concerned that the ramifications will extend internationally. ISSCR Vice President Shinya Yamanaka, Kyoto University, Japan and Gladstone Institutes, U.S., notes the potential impact on decisions for legislating hESC research in Japan. “The U.S. makes an enormous contribution to biomedical research, and U.S.-derived stem cells form the cornerstone of worldwide research efforts,” Dr. Wilmut added. Scientists have devised a method for coaxing mouse embryonic stem cells into forming a highly specific motor neuron subtype. The research, published by Cell Press in the September 3rd issue of the journal Cell Stem Cell, provides new insight into motor neuron differentiation and may prove useful for devising and testing future therapies for motor neuron diseases. Motor neurons in the spinal cord communicate with other neurons in the central nervous system and send long projections out to muscles, transmitting signals that are essential for proper control of movement and posture. Like other neuron classes, motor neurons are known to exhibit tremendous diversity. "The existence of dozens of muscle groups in the limbs of most mammals demands an equivalent diversity of motor neuron pool subtypes," explains the senior study author, Dr. Hynek Wichterle from Columbia University in New York. During normal development, motor neurons settle into specific sections of the spinal cord (called columns), which correspond to the muscles that they will innervate. For example, cells in one area link up with muscles in the limbs, while cells residing in another region innervate muscles in the body wall. Although previous studies have shown that mouse and human embryonic stem cells can be converted into motor neurons, it was not clear whether these were "generic" neurons or whether they could acquire characteristics of the specific specialized subtypes. In the current study, lead author Dr. Mirza Peljto and colleagues showed that removing a key differentiation factor allowed cultured embryonic stem cells to form motor neurons with molecular characteristics corresponding to a limb innervating subtype, without the need for genetic manipulation or added factors. Importantly, when this stem cell-derived subtype was transplanted into embryonic chick spinal cords, the motor neurons settled in the expected columnar position within the cord and had projections that mimicked the trajectory of limb innervating motor neurons. Although encouraging from a regenerative medicine perspective, the authors caution that due to differences in limb and wing musculature, their mouse-to-chick transplantation paradigm makes it impossible to determine whether motor neurons generated in the lab exhibit subtype specific connectivity with limb muscles. However, this method for reliably generating defined motor neuron subtypes may prove to be invaluable for future disease modelling studies. "Motor neuron subtypes exhibit differential susceptibility to neurodegeneration in two prominent motor neuron diseases, Amyotrophic Lateral Sclerosis (ALS) and Spinal Muscular Atrophy (SMA)," says Dr. Wichterle. "The ability to drive the differentiation of embryonic stem cells into disease-sensitive and – resistant motor neuron subtypes could help to uncover new therapeutic strategies." Stem cells might be thought of as trunks in the tree of life. All multi-cellular organisms have them, and they can turn into a dazzling variety other cells — kidney, brain, heart or skin, for example. One class, pluripotent stem cells, has the capacity to turn into virtually any cell type in the body, making them a focal point in the development of cell therapies, the conquering of age-old diseases or even re-growing defective body parts. Now, a research team at the University of Georgia has shown for the first time that a gene called Myc may be far more important in the development and persistence of stem cells than was known before. Myc is traditionally thought of as a cancer-causing gene, or oncogene, but recent studies from the UGA team have established critical roles for it in stem cell biology. The discovery has important implications for the basic understanding of developmental processes and how stem cells can be used for therapeutic purposes. "This new research has uncovered a really unexpected role for Myc," said Stephen Dalton, GRA Eminent Scholar of Molecular Cell Biology and Georgia Cancer Coalition Distinguished Scientist at UGA. "Our work here represents the first mechanistic characterization of how Myc controls the pluripotent stem cell state." The research was published today in the journal Cell Stem Cell. Other authors of the paper include Keriayn Smith and Amar Singh of the Dalton lab at UGA. Smith left recently to begin a postdoc at the University of North Carolina. Dalton also is a member of the department of biochemistry and molecular biology in the Franklin College of Arts and Sciences and is affiliated with the UGA Cancer Center and the Biomedical and Health Sciences Institute. In previous work, Dalton and his colleagues showed that Myc is critical for stem cell maintenance and that it affects widespread changes in gene expression. This latter function is crucial when stem cells differentiate into more specific cell types. In the new research, Dalton's team showed that Myc sustains the important pluripotency process by repressing a "master regulator" gene called GATA6. "Pluripotency is the inherent property of a cell to create all cell types, from an embryo to an adult organism," said Dalton. "It's an extremely important biological process, and knowing how it is controlled is crucial not only from a basic developmental perspective but also so that we can harness the potential of stem cells for the development of therapies, including those for diabetes, cardiovascular disease and a range of neurological disorders. Through a detailed understanding of early development, we hope to apply this information so that pluripotent stem cells can be differentiated into therapeutically useful cell types." "These cells can then be used in a clinical setting to cure degenerative diseases and treat acute injury." The finding that Myc inhibits GATA6 came as a big surprise to the Dalton team and points out that researchers have only seen the tip of the "molecular iceberg" in terms of what Myc does in stem cells. It now seems likely that understanding Myc's role in further detail will reshape current ideas about the basic biology of stem cells. Dalton's new work addressed the uncertainty about how Myc maintains the pluripotency of stem cells by examining what happens when two forms of Myc — c-Myc and N-Myc — are inactivated in pluripotent stem cells. 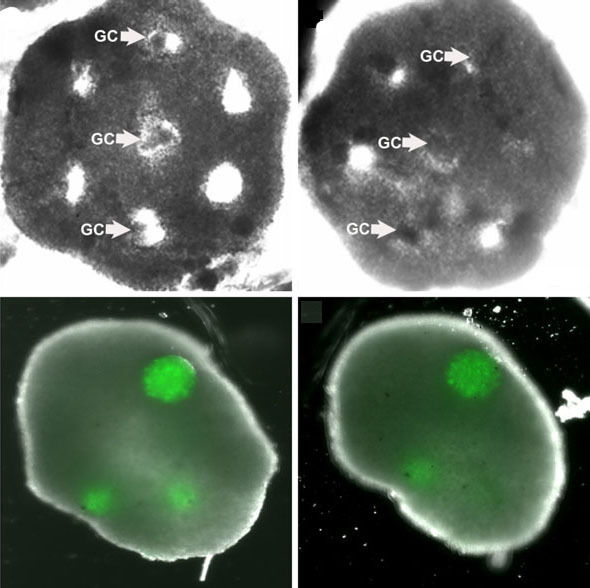 What he found was that either c- or N-Myc is sufficient to maintain pluripotency, but that the absence of both triggers the differentiation of pluripotent stem cells. Myc is therefore acting as a "brake" to restrain differentiation. When the "differentiation brake" is removed, cells lose their stem cell properties, and, potentially, they can become any one of over a hundred different cell types. Pluripotent stem cells can now be made from skin fibroblasts and even from blood samples. (Fibroblasts are cells common in connective tissues of animals and play an important role in the healing of wounds, among many functions.) The conversion of mature fibroblast or blood cells back to pluripotent stem cells is called "reprogramming." Myc also has a critical role in this process. The ability to make stem cells from a patient's blood or skin is going to revolutionize medicine as it opens the way for patient-specific stem cells that would circumvent problems associated with immune rejection, said Dalton. "During the reprogramming of cells, Myc represses genes associated with the differentiated state and primes them for the expression of stem cell genes," he said. "We now speculate that during the early reprogramming stage, Myc serves to change the cell cycle so that stem cells can divide for long periods of time without aging. This is also what Myc does in cancer cells." Dalton said that there is an intriguing relationship between normal stem cells and cancer cells. Since Myc is crucial for maintenance of stem cells and for the development of cancer, pluripotent stem cells represent a good model for tumour biologists. Cancer is thought to be initiated by rogue stem cells found in different tissues, further highlighting the link between stem cell biology, cancer and Myc. "This is clearly going to be a major area of research for many years to come," Dalton said. New findings show the value of genetic studies across human populations and the value of the latest DNA sequencing technologies to interrogate genetic variation. The results, from the latest phase of the international HapMap Project, are reported in Nature. The researchers' extensive study of genetic variation in multiple populations will form a framework for future genetic studies of variation and disease: their findings highlight the need to examine various populations in order to tease out the widest collection of genetic variants, as well as the requirement to deploy sequencing technologies to find as many variants as possible. The HapMap Project seeks to identify signposts on the human genome that will simplify the search for important genetic variants. In the latest phase – HapMap 3 – the researchers looked for variants across the genome in 1184 samples from 11 populations. They chose the large sample set and the wide range of populations to maximize the variation they could capture. The project includes both single-letter differences (single-letter polymorphisms, or SNPs) as well as large differences from the loss, gain or duplication of regions, called copy-number polymorphisms, or CNPs. "Despite the remarkable achievements following from the Human Genome Project, our knowledge of human genetic variation remains limited," says Professor Richard Gibbs, professor of molecular and human genetics at Baylor College of Medicine in Houston, Texas, and director of the BCM Human Genome Research Center. "These results tell us more about human genetic variation and about how to study variation successfully." The results show that rarer variants are distributed more unevenly among populations. This might be expected – evolutionary theory implies that the common variants are generally the older ones, having had greater time to spread through a population – but also cautions that genetic studies should include a wide range of population groups to maximise discovery of more recent, population-specific variants. "The closer we look at human genetic variation, the greater the granularity," explains Professor Manolis Dermitzakis, from the University of Geneva and one of the project coordinators, and formerly at the Wellcome Trust Sanger Institute. "This new version of the HapMap will help us design ways to do that – to sort the wheat from the chaff." In addition to the genotyping studies described above, HapMap 3 also sequenced ten segments of 100,000 bases from well-characterized regions of the human genome. Unlike discovery using DNA chips – as used in most studies to date – direct sequencing is not biased towards more common variants, but gives a direct estimate of the frequencies of variants. The researchers found that most variants were relatively uncommon (found in less than one person in ten), but they also found a large number of rare variants (each found in less than one in 100 people) or 'private' variants (found in only one person). Almost eight of ten variants were new and almost four of ten of those seen in less than one in 100 people were found in only one population. From the results, the researchers suggest that variants in some genes, including genes involved in the immune system, wound healing and sense of smell, are under selection in different populations. These genes can now be studied to learn about how these systems work and about disease resistance. These findings show the value of having large studies that include many populations and samples to achieve comprehensive understanding of human variation. "Some have talked about how little has come from the Human Genome Project over the past ten years, but perhaps they forget how little we knew then," says Professor David Altshuler of Massachusetts General Hospital in Boston and the Broad Institute of Massachusetts Institute of Technology (MIT) and Harvard University in Cambridge, Mass. "The HapMap and other large-scale projects have transformed our understanding of the human genome and its relation to health and disease." This research is dedicated to Leena Peltonen for her vital leadership role in this study, and in memory of a valued friend and colleague. Professor Peltonen died in March 2010. Details of the project and participants can be accessed at http://hapmap.ncbi.nlm.nih.gov/. The USA National Institutes of Health, the National Human Genome Research Institute, the National Institute on Deafness and Other Communication Disorders and the Wellcome Trust supported the majority of this work. Funding was also provided by the Louis-Jeantet Foundation and the NCCR 'Frontiers in Genetics' (Swiss National Science Foundation). Baylor College of Medicine (BCM), Houston, Texas is the only private medical school in the greater southwest and is recognized as a premiere academic health science center known for excellence in education, research and patient care. For 2009, U.S. News and World Report ranked BCM 13th overall among the nation's top medical schools for research and 7th for primary care. BCM is also listed 13th among all U.S. medical schools for National Institutes of Health funding, and 2nd in the nation in federal funding for research and development in the biological sciences at universities and college by the National Science Foundation. During the reaccreditation proves in March 2007, BCM received "Accreditation with Commendation" for exemplary performance in fulfilling the accreditation requirements as a provider of continuing medical education. Any two humans are more than 99 percent the same at the genetic level. But, the small fraction of genetic material that varies among people can help explain individual differences in susceptibility to disease, response to drugs or reaction to environmental factors. Variation in the human genome is organized into local neighbourhoods called haplotypes, which usually are inherited as intact blocks of DNA sequence information. Consequently, researchers refer to the map of human genetic variation as a haplotype map, or HapMap. "The generated HapMap provides an important foundation for studies aiming to find genetic variation related to human diseases. It is now routinely used by researchers as a valuable reference tool in our quest to use genomics for improving human health," said Eric D. Green, M.D., Ph.D., director of the National Human Genome Research Institute (NHGRI), a part of the National Institutes of Health, which provided major funding for the HapMap Project. Researchers analyzed approximately 1.6 million SNPs in about 500 samples from the four original populations and more than 650 samples from the seven new populations. In addition, the consortium sequenced 10 regions totalling about 1 million base pairs in 692 samples from this set in 10 of the 11 populations. More than 800 copy-number variants, where people have different numbers of copies of genomic regions, were also added to the resource. The researchers assessed the latest generation HapMap for its ability to predict SNPs in other populations. They found that using one population to predict another population's variants works for common variants and for some less-common variants in related populations. However, it does not work well for rare variants in related populations, meaning that rare variants are likely to make much more population-specific contributions to disease. This finding underscores the value of efforts already underway that use efficient 'next-generation' DNA sequencing technologies to sequence large numbers of whole genomes within various populations to find rare variants that contribute to disease. "The HapMap project has been a stellar example of how improved technologies and dedicated work on obtaining DNA samples from individuals in major populations allows us to provide more detailed resources for studies of human disease," said Richard Gibbs, Ph.D., director of the Human Genome Sequencing Center at the Baylor College of Medicine. Researchers can access HapMap data through the NIH National Center for Biotechnology Information.